How do you turn a typical modern hotel ballroom/conference suit from a universally bland multifunction room into a magical, fun-filled, colourful and exciting place to party? Simple! Call in the experts. From simple yet effective table centres to state-of-the-art lighting rigs and everything in-between, we have the know how. Room theming is also available, from the heat of a Rio Carnival to the chill of a Lapland Christmas, from Medieval to Space-age, or any custom theme that you can think up! 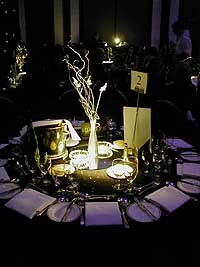 A simple, but smart table centre, showing modern floral decoration on black table cloth with 'pin-spot' down lighting. 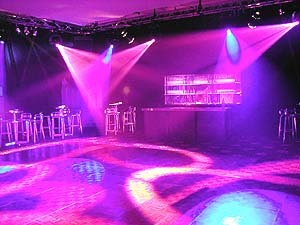 A colourful dance floor lighting rig, with modern café bar aluminium tables, chairs and bar. The Empress Suite at The Grand Hotel, Brighton. 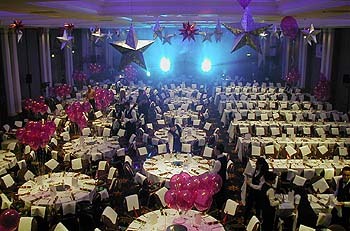 Decorated with suspended stars, balloons and strong lighting. Again, The Empress Suite at The Grand Hotel, Brighton. 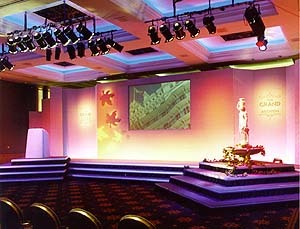 This time set for an awards presentation, with water feature, video screen, lighting rig, stage and lectern.